Hi, everyone! So I had a completely different route for todays blog post, which was geared towards fitness, but you know.. life happens and sometimes you just can't get it all done. Actually it's just been way too cold these past few weekends and it's made it really hard to get blog photos done. I'm trying to avoid frost bite, feel me? 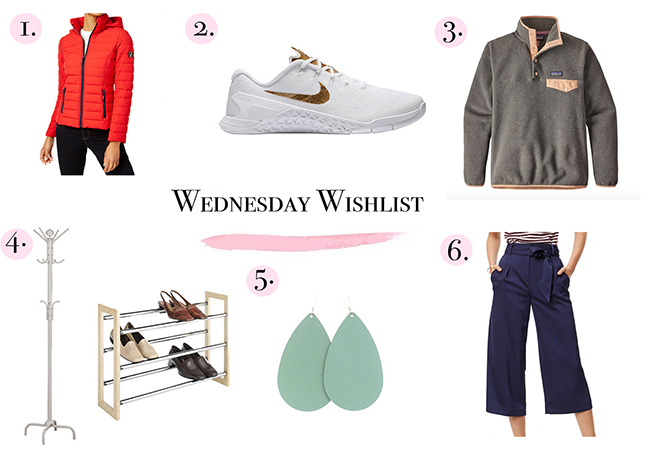 So I switched a few things around and decided to share some items that have been on my wishlist lately from fashion to fitness and even home items. 1. Nautica Puffer Coat -- I'm a little late on the whole shopping for a winter coat deal, but I've been very indecisive. The black puffer coat I've had for years (that has gotten me through college, RIP) has officially started to tear on me so I kind of have no choice but to replace it. It's just your average black puffer coat that I actually got from Hollister, but it was amazing so finding the perfect replacement has been hard. The reviews on this Nautica puffer were amazing and the red color is super fun! Hoping to snag it on awesome deal. 2. Nike Metcon 3 AMP Training Shoe -- I've been long due for a new workout shoe. My current Nikes kill my ankles when I workout, so you'd think with me working on M-F I'd want to get a new pair ASAP but I just haven't found the right pair. I want to invest my money in something good. Although these aren't a running shoe, they're perfect for my resistance training days. Plus when I saw them in store I couldn't take my eyes off them. 3. Patagonia Fleece Pullover -- Ever since Tyler got me my first Patagonia for Christmas I need more!! Lol, but seriously.. he got me this Patagonia for Christmas and while I do love it I saw one of the Synchilla pullovers in store and so soft. Got my eye on this baby! 4. Coat Rack & Shoe Rack -- Yes, a coat and a shoe rack are really on my wishlist! When I graduated from college my parents refinished the basement for me but there are NO. CLOSETS. DOWN. HERE. I finally got enough dressers to handle the clothing situation, but my coats are everywhere and I've run out of unique ways to store my shoes, so I'm hoping to get my hands on these items like tomorrow. 5. Minty Fresh Nickel & Suede -- If you haven't realized by now, ya girl loves her some Nickel & Suede earrings! They're insanely lightweight and cute. They just released some new colors, this being one, and ugh, I want! As if I don't have enough pairs of earrings. 6. Shimmer Wide Legs Pants -- In all honesty, I have a million items in my cart at LOFT right now. I think out of all though I want these the most. As I've previously said, one of my goals for 2018 is to go outside my comfort zone with things and these pants are definitely going outside my zone with fashion. I think they would be so fun to style, especially for the spring!